After being bullied to the point of a suicide attempt, a big part of me healing was decided that I never wanted for anyone to feel the way I did, again. 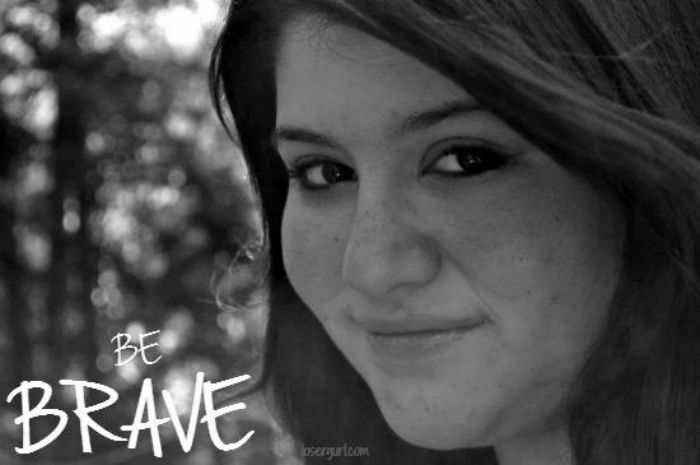 That was when I decided to start writing about #BeBrave, my idea of how to help stop bullying. To #BeBrave, you need to stand up for the bullied, stand up to the bullies, and stand up for yourself. I started sharing my way of bravery, especially online, But then, there was a time when I needed to be brave in person. It was time to stand up, and #BeBrave. As I was walking down the hallway in school one year, I saw three large boys crowded around a locker next to a smaller boy. At first they looked to just be messing around but I watched for a little while and realized that the other boys were bullying the smaller one. They were making fun of his appearance, his height and making fun of him for enjoying reading. The smaller boy was almost hiding behind his textbook, trying to avoid these other bullies but they wouldn’t let up. Multiple people saw this going on but didn’t say anything or do anything, just continued to walk down the hallway. I decided that this was a time that I needed to #BeBrave and stand up to these bullies, for the bullied boy. I went up to the boys bullying the other boy and told them to knock it off. I told them that what they were doing didn’t make them any more funny or cool, that it just made them rude and what they were doing was bullying. I then helped the smaller boy up from the . I made sure he was okay, and told him if he ever needed someone that he could come find me. Sometimes being brave is standing up for someone else even though you’re scared of the consequences. I was scared that these boys would turn the bullying on to me but I decided that helping this other boy was worth it. The bullying never turned to me either. In fact the boys who were bullying apologized to ME, but I told them that it wasn’t me who was owed an apology, the boy was. They apologized to him. As far as I know, they never bothered him again. Ally is a 17 year old singer, songwriter, blogger, and anti-bullying activist who wants to help the world #BeBrave and end bullying.